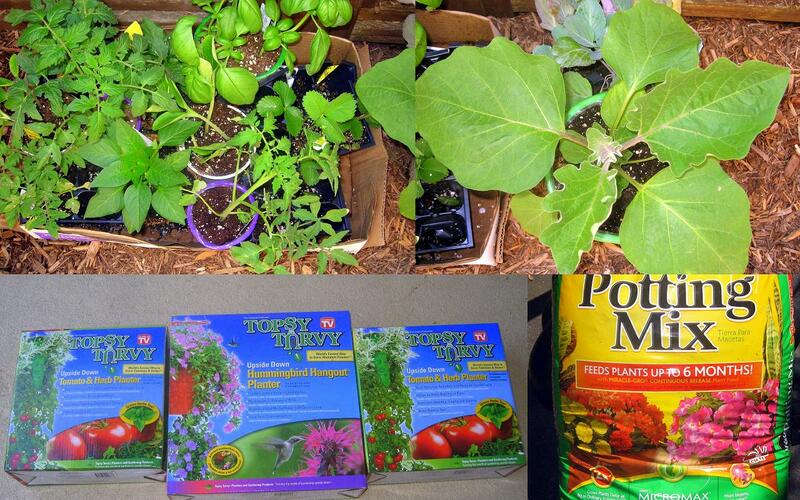 One weekend, a dear friend introduced me to “topsy-turvy” gardening. My mom loves to garden and she has the patience and the passion. I don’t have a big backyard and we mostly have pavers, trees and shrubs. There really isn’t a whole lot of ground where I can plant vegetables and herbs. But to my surprise, I was intrigued with the prospect of harvesting my own tomatoes, strawberries, herbs, eggplant, zucchini, squash and a little treat for humming birds! I have a topsy-turvy life, it seems. I have plenty of projects that have not seen its completion. So surely I don’t have shortage of tasks I need to complete, but I’m having a major writer’s block that I need a little diversion. The other project that I have to work on in the next few weeks is emotionally exhausting so tackling a “gardening challenge” can be fun and uplifting? Or am I setting up myself to another source of frustration? Of all my four children, my youngest is probably the one that got my mother’s green thumb and love for the outdoors. My 9yo gets excited planting annuals, perennials, and vegetables. Honey, You plant the tomatoes, I will bring the basil and mozzarella. What a great treat that will be! With the help of our crumbcatcher, it will be a wonderful garden. Enjoy the experience. I hope you'll come by and follow me too. We've been working on our container "gardens" too.